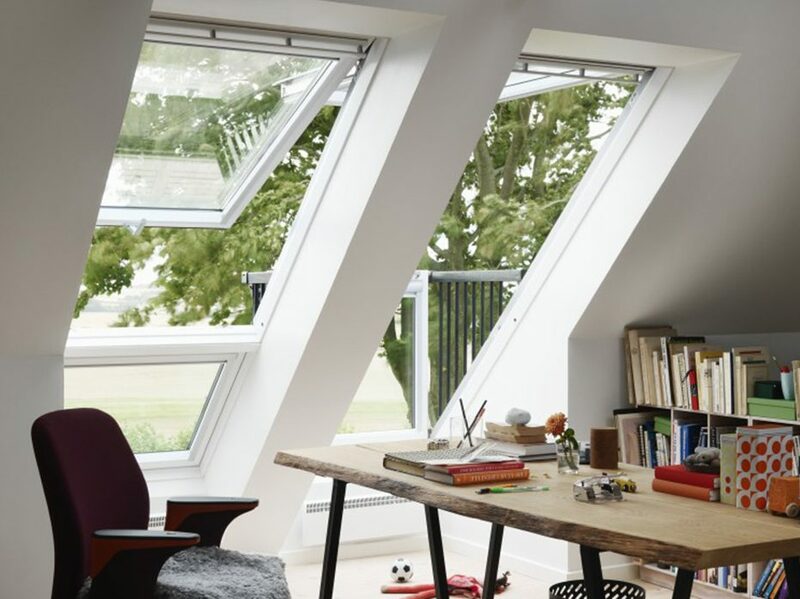 Pitched roof windows can transform your space, but which ones are right for you? Read this handy guide from Roofing Superstore to find out by continuing to scroll, or by clicking the question you need answered below. 2. What type of pitched roof window do I need? 3. How do I want my window to open? 4. How do I want my window to operate? 5. Which pitched roof window brand is right for me? Who says windows are just for walls? If you’re looking for a clever way to add more natural light to a room, the solution could be right above your head. 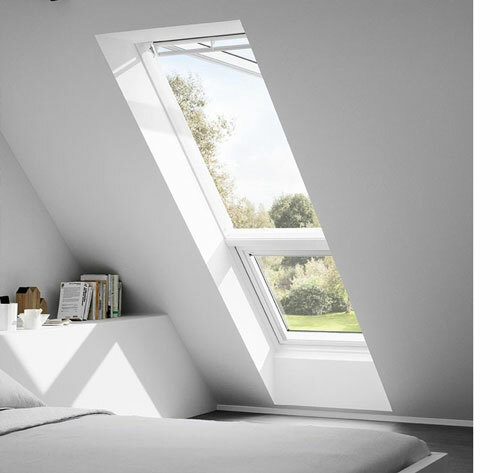 Pitched roof windows are known to let in three times more rays than the vertical variety - great if you wanted to drench your loft in sunshine or add daylight to a dark, uninhabited room. 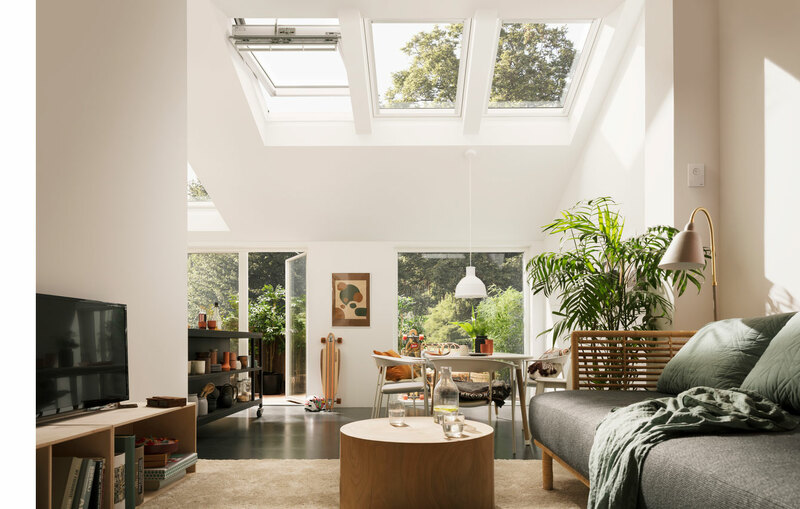 From simple VELUX roof windows to huge skylights, cleverly placed roof windows can transform your space. But the right kind of roof glazing does more than just bring the outdoors in. It can highlight design features in a dining room, free up much-needed wall space in a kitchen or bring fresh air into your en-suite shower room. But how do you choose the right roof windows for you? Roofing Superstore is here to take you through the decision-making process step by step. All you need is a bit of roof-side creativity - and this handy guide. What type of pitched roof windows do I need? When it comes to pitched roof glazing, each room of your home comes with its own design requirements. Here are a few things to keep in mind. Design and finish are usually the most important considerations when it comes to choosing the perfect roof windows for the hub of our homes. The living room is not only where you spend most of your time, but also the face your home shows to the outside world. Luckily, pitched roof windows come in a range of stylish finishes to really give your room the wow-factor. Love the minimalist look? Go for pitched roof windows with a painted white finish. After something more cosy? Many manufacturers offer windows in traditional wood finishes like pine. Want to stare at the skies while you soak? Putting a roof window into your bathroom lets you add this extra touch of luxury. But sloping bathroom windows have to work extra hard to allow ventilation in, while also protecting your privacy. Choosing pitched roof windows with opaque glazing can avoid red faces the next time you bump into your neighbours. Kitting out your kitchen with sloping roof windows not only makes a stunning style statement, but can also free up valuable wall space for shelves and cupboards. As in bathrooms, the humidity in kitchens can be an issue. Fortunately, there are moisture-resistant pitched roof windows available that can reduce condensation, with top brand RoofLITE specialising in this field. Bedrooms need to be cool, comfortable and above all quiet. If you live near a flight path or busy road, choose pitched roof windows with extra noise reduction to maximise your chances of a good night’s sleep. They can even minimise the sound of the rain by 50% - great if the weather’s being a bit British. You’ll also want the extra comfort of a window that reduces heat loss in the winter and prevents overheating in the summer and for that you’ll need to choose glazing with a lower U-value. How do I want my window to open? The next decision you’ll need to make when choosing your roof window is how you want them to open. There are three main ways: centre pivot, top hung and side opening. In the UK, top hung and centre pivot are the most popular, meaning you’ll find lots of design and finish options from all the major manufacturers such as VELUX, FAKRO, RoofLITE and OptiLight. But what else should you bear in mind when choosing your opening method? 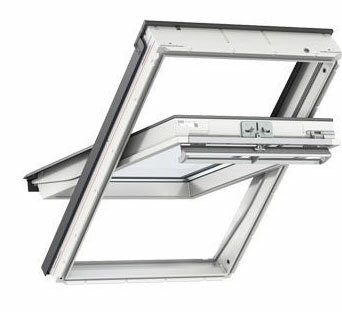 How it works: The most popular roof window on the market, you open centre pivot windows with a control bar that’s located at either the top or bottom, meaning half of the window comes into the room when it’s opened. Centre pivot roof windows are popular as they’re so easy to maintain - they come with a 180 degree rotation function which allows for easy cleaning on both sides. Choose centre pivot if... you want bags of choice in terms of design and finish, or you’re trying to keep costs down. 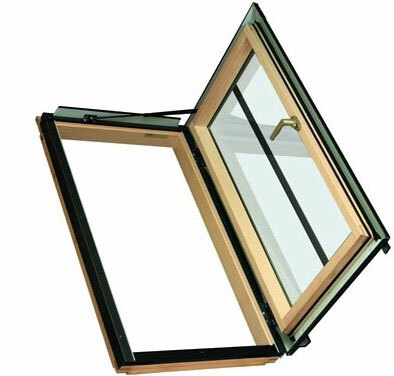 On average, centre pivot windows are between £50 to £100 cheaper than like-for-like top hung models. Central pivot windows can be operated by remote control too, making them a great choice for hard-to-reach places. Avoid centre pivot if... uninterrupted views are important to you. Half the sash remains in the room when fully open, so there’ll always be a slight obstruction, both to your eyes and perhaps to your head if you’re tall. Centre pivot isn’t an option if your pitched roof window needs to be a means of escape due to the sash's positioning when open. If your window needs this life-saving benefit, you’ll need a top-hung window. How it works: With the pivot at the top, all of the sash will be outside of the room when the window’s fully open. Top hung windows are normally installed at eye-level as they’re so good for enjoying the view. Choose top hung if... the pitched roof window needs to be a means of escape - many top hung roof windows have been built with this exact scenario in mind. Top hung is also a great option when space is at a premium as none of the sash protrudes into the room and you’ll be able to open it no matter what furniture you have underneath. Avoid top hung if... you want a window that opens at the touch of a button - many brands don’t offer this function for their top hung windows. 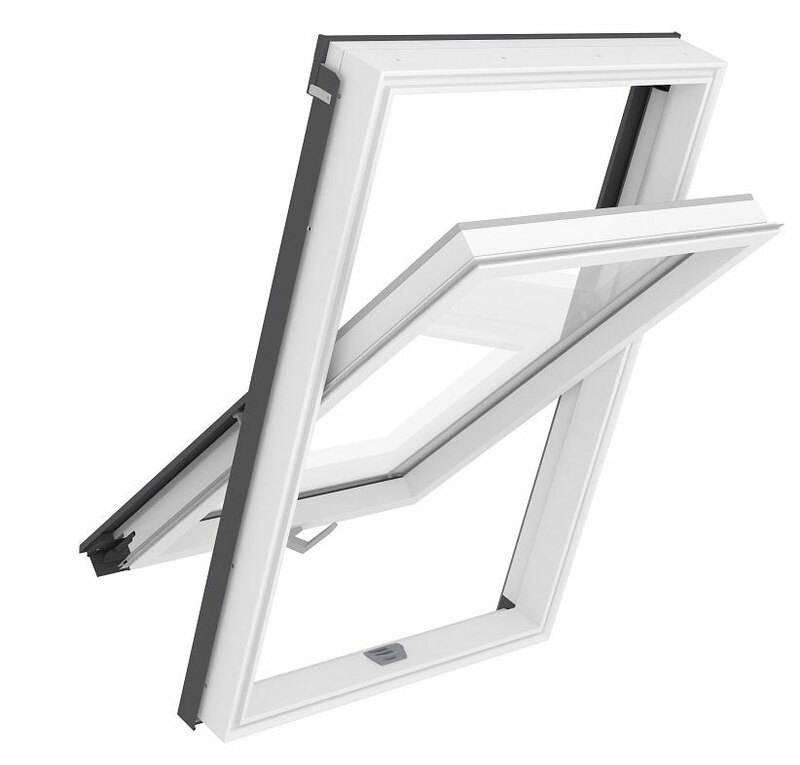 How it works: Easy-to-open, the pivot on a side hung window is found on either the left or right. You’ll need to take a look at your roof from outside to figure out which option is best for you. With side-hung windows, the whole sash is outside the room when the window is open. Choose side hung if… you want to add light to uninhabited spaces, such as a loft that’s used only for storage. Side hung windows are great for letting the fresh air in, because they secure in three different positions, giving you complete control over the amount of ventilation. Avoid side hung if… you want a window for an inhabited space, such as a loft bedroom or lounge. How do I want my window to operate? While many prefer the reliability of windows you open by hand, electrically-operated windows are great for those in out-of-reach places. Some even have rain sensors so that they close automatically if it starts to pour. Reliable and easy to use, manual windows are operated by hand or, if they’re out-of-reach, by the use of an opening rod. They’re popular because they’re easy to maintain and having no electrical function means lower energy bills. Love kitting out your home with the latest technology? Electric windows are perfect for you, letting you open and close your windows at the touch of a button, from either a remote control or a switch that’s mounted on the wall. Although these are more expensive than manual options, they’re a great choice if your window is hard to reach. This is demonstrated in the image to the right. An eco-friendly electric option, these can also be operated remotely and come without the need for wiring because the technology is charged with solar energy. 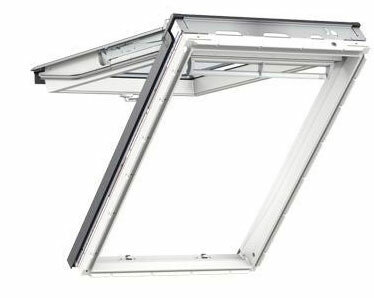 VELUX is the market leader in solar windows. What if I want a pitched roof window that doesn't open at all? Sloping fixed additional windows can be added to most projects to increase window space without being opened. These complement pitched roof windows, so that although they’re non-opening, they can still brighten up your space, making your room look that little bit more special. They're a cost-effective addition and can make your entire roof window look like an expensive centre-piece. The picture to the left demonstrates just how an additional pane of fixed pitched roof window can upgrade your space. Which pitched roof window brand is right for me? VELUX are the market leaders - in fact, the brand is so popular that people tend to call all pitched roof windows VELUX windows by default. It’s no wonder - VELUX has a great reputation for quality and has been around since 1942. FAKRO and OptiLight are newer to the scene, but both are strong competitors to VELUX. 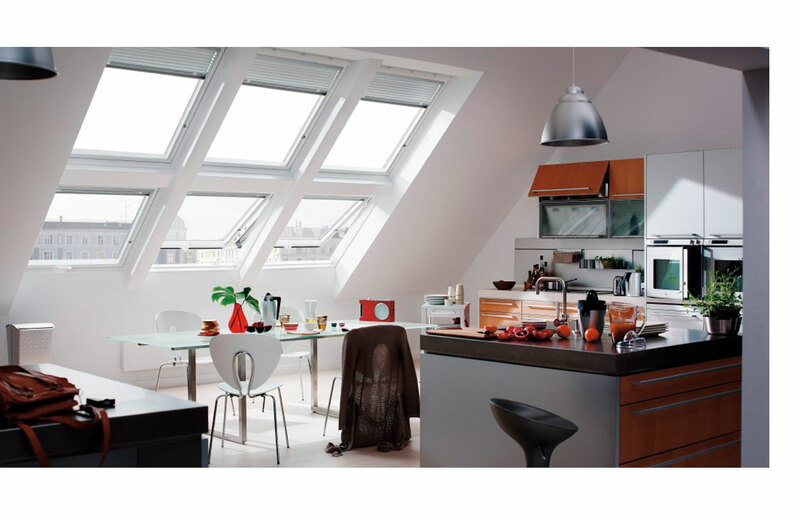 RoofLITE is a sister company to VELUX and is thought of as the tradesperson’s choice because of their great design and price. 1. What kind of glazing should I go for? 2. What are u-values - and which is best? 3. What kind of finish do I need? 4. What size windows do I need? 5. Where should my pitched roof window be located? 6. Do I need planning permission? 7. What flashings should I get? 8. What blinds can I have? 9. How should I install my pitched roof windows? What kind of glazing should I go for? There are a number of different glazing options that can improve the performance of your roof windows. Common upgrades include triple glazing which reduces the amount of heat that is lost through the glass – great for maximum energy-efficiency. Triple glazing is perfect for bedrooms, keeping you toasty on even the coldest of nights. Noise-reducing glazing is a good choice if you live in an urban area, while extra-strength and enhanced-security glazing make your windows more difficult to penetrate. Extra-strength glazing is usually paired with laminated glazing on the inner pane, to stop it from shattering when it is broken. What are u-values - and which is best? All roof windows come with what’s known as a U-value rating. A window’s U-value is a measure of how well heat is transferred by the whole window (including the frame, sash and the glazing). The lower the U-value, the better the window is at keeping heat inside your home, no matter how cold it is outside. As well as being energy efficient, your home will feel more cosy, with fewer hot and cold spots. What kind of finish do I need? The type of finish you go for will be influenced by the look you want to achieve, as well as practical considerations such as protecting your windows against moisture damage. This traditional wood always looks stunning, making it a popular choice for loft bedrooms and living rooms. Long-lasting, this classic material doesn’t date and is neutral enough to match most interiors. Uncoated pine is less expensive than PVC coated windows, normally by around £30 to 40 per window. Pine finish is shown above. Another popular choice, a timber frame painted in a white looks simple and chic, perfect for adding some pared-back Scandi style to your home. The white shiny surface reflects the light, maximising every ray that comes through your new roof window. With these kinds of window, a timber frame is coated with a protective white polyurethane finish for added durability. More moisture-resistant than timber alone, it’s a great choice for humid places such as kitchens and bathrooms. White polyurethane finish is shown above. 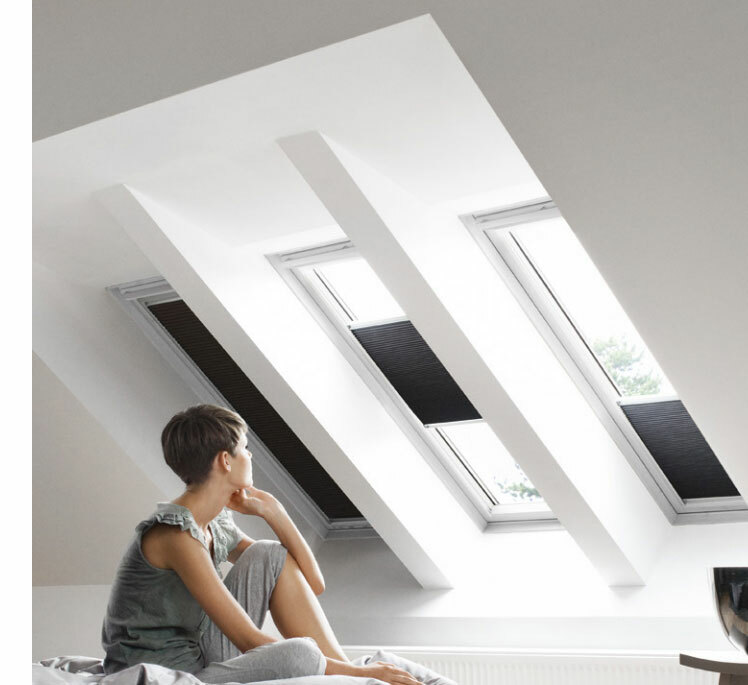 Give your home a dash of drama by choosing roof windows with a black polyurethane finish. Increasingly popular, the black finish won’t fade and the colour does not affect the window’s U-value. These are available custom, or as side-hung uninhabited-space only windows. Long-lasting and easy-to-maintain, PVC has the same moisture-resisting properties of polyurethane, but uses a polyvinyl frame rather than timber. If energy-efficiency is important to you, PVC offers excellent insulation. White PVC is shown to the right. What size windows do I need? If you’re planning on buying a VELUX pitched roof window, this window size chart will come in handy. But in short, the bigger the window the more light you’ll get into your room. While that may sound great in theory, you’ll need to balance this out with other practicalities - after all, a living room that’s too bright or too warm may stop you being able to sit there comfortably. A rough rule of thumb is that the windows should be at least 10% of the floor space. But you should also think about the style of your property. If your home is modern, large expanses of contemporary glass may work well. But if it’s more traditional, smaller windows may be more in-keeping. Where should my pitched roof window be located? When it comes to where you’ll locate your windows, it’s always good to get advice from the experts. Your builder will be able to advise you because there may be beams, electrics or ventilation issues that you need to factor into your decision. The other thing to bear in mind is the position of the sun throughout the day. Want your lounge to make the most of the evening sun? Try to install your windows in a west facing direction, for example. Another good tip to remember is that the higher the window is fitted, the more light will enter the room. Unless you live in a listed building or conservation area, you don’t normally need to apply for planning permission for pitched roof windows. That’s because they normally fall under Permitted Development as you’re not doing anything to the volume of the roof. There are exceptions though. It’s best to check with your local council if you’re going for some kind of grand design where your windows are going to be larger than a ‘reasonable’ size, or if your window juts out beyond the roof plane by more than 150mm. And you should also let them know if you plan to install a side-facing window that overlooks your neighbours if you’re not going for obscure glazing. What are pitched roof window flashings? When it comes to pitched roof windows, you’ll also need to consider which kind of flashings you are going to buy. These weatherproof pieces of material help make your windows water-tight, stop damp and mould and are designed to be energy-efficient. Everything from your tiles to the pitch of your roof will affect the type of flashings you need. What kind of pitched roof window blinds can I get? Now comes the fun part - choosing pitched roof windows blinds. Most brands offer you the option of having integral blinds, sandwiched between the panes of glass for a neat finish. But they don’t just look nice. Some blinds could keep your home warmer by up to 25%. 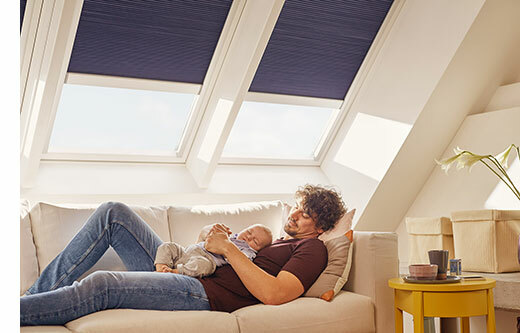 VELUX blinds come in a range of options with electric blackout, roller and children’s options available. Solar roller shutters can block sunlight during key moments of the day, reducing heat before it even hits your window. FAKRO blinds come in Venetian, pleated, blackout and roller, for effective light control and a neat finish. How should I install my pitched roof windows?